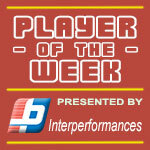 Dalarian Williams (198-SF) had a great game in the last round for Prawira and receives a Interperformances Player of the Week award for round 19. He had a double-double of 30 points and 14 rebounds, while his team beat Satya Wacana (#5, 4-12) 77-69. Prawira maintains the 5th position in their group in Indonesian league. Prawira is rather a weak team placed in lower part in the standings. They need more victories to improve their 4-9 record. Williams turned to be Prawira's top player in his first season with the team. Dalarian Williams averages this season 22.3ppg and 10.7rpg. Second best performed player last round was Raymond Miller (204-F-88) of Satya Wacana. He is American forward in his first season at Satya Wacana. In the last game Miller recorded impressive double-double of 19 points and 22 rebounds. Bad luck as Satya Wacana lost that game 69-77 to slightly higher-ranked Prawira (#5, 4-9). Satya Wacana managed to keep the same 5th spot in White Group. 12 lost games are too many comparing to just four victories Satya Wacana managed to get this year. Miller is a newcomer at Satya Wacana and quickly became one of team's most reliable players. Third place about best performers goes to forward Dior Lowhorn (201-F-87) of league's second-best Satria Muda. Lowhorn scored 21 points and grabbed fourteen rebounds (!!!). He was a key player of Satria Muda, leading his team to a 92-57 easy win against #4 ranked Siliwangi in a game of the week. Satria Muda needs these victories very badly if they think about taking over top position in Red Group. Their record at this point is 8 victories and 6 lost games. Lowhorn has a very solid season. 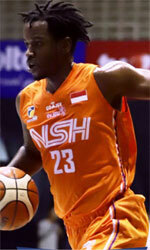 In 3 games in Indonesia he scored 23.3ppg.